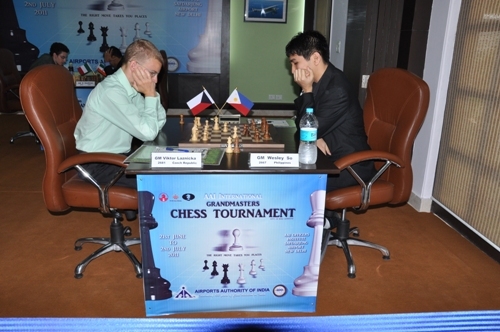 New Delhi, June 22: Indian National champion Parimarjan Negi got himself on the scoreboard with a convincing win over women’s world champion Hou Yifan of China in the second round of the inaugural AAI Grandmasters at the AAI Officer’s Institute on Thursday. Negi’s win over Yifan came in 32 moves. 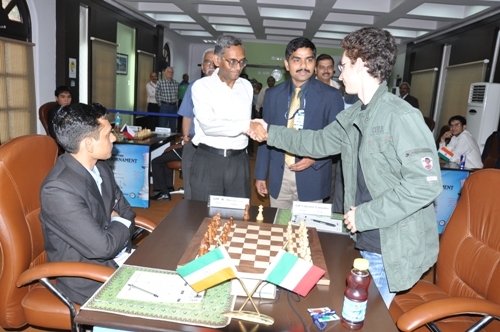 Meanwhile top seed Fabiano Caruana of Italy and Czech champion, Viktor Laznicka scored their second successive wins even as India’s Krishnan Saskiran suffered his second loss and Filipino Wesley So his first defeat. Sasi lost to Caruana in a complicated game lasting 45 moves and where both players were in time trouble at one time. Laznicka beat Wesley So in 39 moves just before the first time control and the winner described the result as “slightly lucky”. Interestingly white won the games on each of three tables and each of the six games have produced results. Replay the games with computer analysis. So at the end of two rounds, Caruana and Laznicka share the lead with perfect scores of two out of two, and Negi and Wesley have one each. Sasi and Yifan have yet to score as all three games ended in a decisive manner for the second day running indicating an aggressive mindset for the young field. 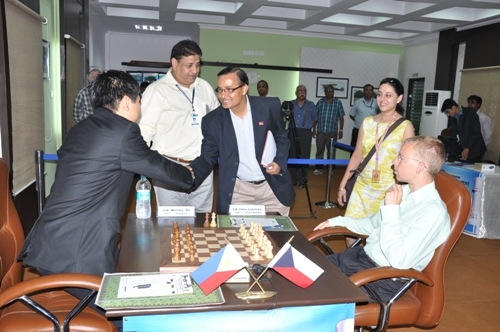 The games in the second round were inaugurated by Mr. Ajay Chaudhary, Secretary, Ministry of External Affairs. Also present were Mr. V P Agrawal, Chairman of the AAI. Negi, who admitted he could have drawn and split the points against Caruana in the first round on Wednesday did not make any mistakes in the second round against Hou Yifan. In a Sicilian Dragon with the Yugoslav Attack, Negi held a microscopic advantage virtually from the beginning. He held that edge and kept piling on the pressure and when Yifan made the mistake on the 19th move with f6 weakening her defense, Negi knew he had the game in his pocket. 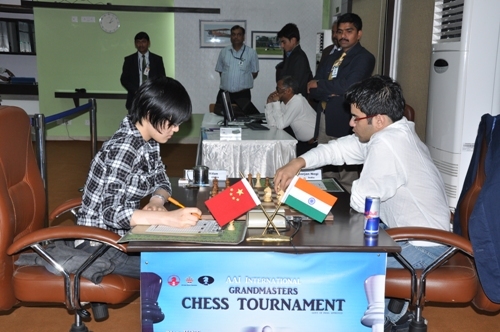 He got his full point in 32 moves, when the Chinese player realized she had no chance of salvaging even half a point. Still Caruana was rather elated a perfect start with two wins. “It is always nice to start with two wins. I enjoy such round-robin tournaments. They are tough and good to raise our level of chess. I did not have any strategy as such, but there is still a lot of games to go,” he said. Laznicka called Wesley So a tough opponent and his win as a good one. In a Nimzo Indian Classical, Wesley So with black managed equality. But somewhere down the line, the Filipino became aggressive and lost. “I felt it was fairly equal but he allowed me to get into a better position all of a sudden.” Sasi resigned after 45 moves. Results for second round: Fabiano Caruana (Ita) beat Krishnan Sasikiran (Ind); Viktor Laznicka (Cze) beat Wesley So (Phi); and Parimarjan Negi (Ind) beat Hou Yifan (Chn). See more photos from the second round.